This is a Garden Village Junior site connected to the Swansea Junior Leage website. A good site with lots of information on the seniors. Worth a look. Lewis's TV & Electrical is a long standing family business with a reputation for excellent customer service. Established in 1946 by Robert Lewis in Gorseinon, near Swansea, South Wales, the business has upheld its traditional values such as customer satisfaction and value for money while managing to keep ahead of modern day technology. Our helpful, friendly sales and engineering staff have a wealth of experience and product knowledge. Lewis's is well known for excellent after sales service and this has enabled us to enjoy long-term associations with many of our customers and their families. Technology has progressed rapidly in the last 55 years, a far cry now from the 12" black and white televisions, in cabinets as large as modern day refrigerators, that Robert Lewis was installing in the early 50s! In those days there was no stereo, no video recorders or DVD players and no satellite television or computers, how things have changed. But one thing has not changed and that is our dedication to customer service, due to which we are now renting and selling television sets and a vast range of other household products to the children and grandchildren of those very people who bought their first television from us way back in the 50s. We now stock a full range of the most up to date models of televisions, satellite receivers, videos, DVD players, audio systems and domestic appliances from manufacturers such as Panasonic, Hotpoint, Hitachi, Toshiba, Samsung, Cannon and Dyson. For more information about their products click above. Established for nearly 70 years, the Brisco Group of Companies has grown from strength to strength in the service industry, on its practise of putting the customer first, and providing the highest standards of service and customer care throughout the business. Our group is made up of key specialised companies offering quality, service and expertise, namely Brisco Gas, Brisco Waste Disposal, Brisco Plant Hire and Brisco Truck Rental. 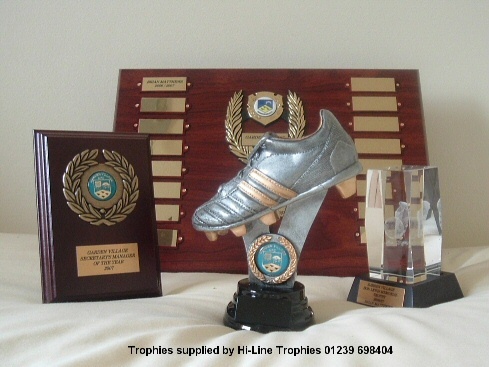 Suppliers of high quality trophies to Garden Village. WE ARE BASED IN BRIDGEND, MID GLAMORGAN, SOUTH WALES, UK. WE RUN NINE YOUTH SIDES, AND HAVE OVER 200 CHILDREN ON OUR BOOKS, FROM UNDER SEVENS TO THE UNDER SIXTEENS. Serendipity is a haven for those seeking something different and distinctive in furniture and fittings. A personal service is guaranteed, as we are a family run business with years of expertise. Visit our well-stocked showroom of over 2,000 square foot, plus workshops situated in Swansea, just off the M4. We are open 7 days a week, from 10am to 5.30pm, Monday to Saturday and from 10am to 4pm on Sunday. South Wales Largest Car Dismantler. 1000,s of Damaged Cars in Stock from skoda to Porsch. Winch Wen Industrial Estate, Swansea. History of Swansea, featuring Gorseinon.